It's late January and you haven't filled the freezer yet. All hope is not lost. Numerous areas across the country are open for hunting as late as February. Life get in the way of your time in the woods this season? Don't fret. These spots are open late just for you. Maybe you were just too busy at work or maybe the kids were playing tournament soccer. Somehow you messed around and missed the whitetail rut. Do not despair. While you might not nail one as it trots after a hot doe in November, you can still fill the freezer. Here are a few states in each region that keep the whitetail door open for you until the bitter end. If you live north of the Mason-Dixon Lineâ€”yes, I'm talking about you snowbirds from Maine, Vermont, Connecticut, and Massachusettsâ€”your seasons pretty much fizzle out in late December. By January it's so cold that Southerners simply wouldn't venture out in the deer woods even if they were open. But if you dareâ€”and likely only if you have a friend or relative living in the suburbs of Suffolk County, New York...that's right: Long Islandâ€”you can hunt with your bow or with a special firearms permit until January 31. Sure, 1.5 million people live on this "island" that abuts the Atlantic Ocean and several million more people to its west, but if you find yourself a few acres behind one of the many giant houses in the suburbs, you, too, can hunt deer almost until Valentine's Day. And that's perfect because on Valentine's Day your sweetie will want you to do other things...like quit hunting. You know the drill. The season begins early because it's so hot and deer start procreating as early as late summer. With the long growing season and ideal habitat for deer, they reproduce like rabbits and thrive like a virus in a test tube. Therefore, state game agencies have instituted some of the longest and most liberal seasons in the country to counter the whitetail's prolific breeding. In some states, like South Carolina, that means you can shoot a deer per day for several months. But if you've totally missed the boat, you can hunt Florida's Zone B (it's the central part, just west of Disney World) or Zone D in the panhandle until February 15. Heck, in another month it will be turkey season, so you can just hunt on through the whole year there as if you are starring in hunting's version of The Endless Summer! Likewise, Mississippi's southeast archery zone also closes on February 15. So, if you're jonesing for deerâ€”and you live elsewhereâ€”look to Mississippi or Florida for some backstrap-stripping action. On the northern end of Dixie is Virginia. Virginia is neat in that although it most identifies with southern states, it also identifies with states like West Virginia and Ohio. Northeasterners, like New Yorkers, New Jerseyans, Marylanders, and Delawareans, know where Virginia is on the map, mainly because it is a whitetail Shangri-La. Of all the states in the union, some parts of Virginia (including Fairfax County and Prince William County) likely pack more whitetails per acre than anywhere in the world. Copious sub- urban centers with myriad flowerbeds, mild weather, and zero predatorsâ€”save for the occasional Mercedes Benzâ€”make it perhaps the whitetail's favorite place. But then auto insurance companies and city managers began feeling the economic impact of having too many deer, and so officials began allowing suburban archery hunting. Soon deer hunting clubs, like Suburban Whitetail Management of Northern Virginia, formed, and their members get access to thousands of acres of property. Anyone can join after proving proficiency with a bow or crossbow. Then you get to hunt in the backyards of Fairfax County and others, where there are so many deer that insurance companies quiver and even some liberals understand that hunting is necessary. But you don't have to join a club to hunt until March 26 in Virginia, the latest whitetail season in the country. All you need is permission from a homeowner, a bow, and a suburban archery tag that you can buy online or at any hunting retailer. Most hard-core deer hunters view the Midwestâ€”the corn- producing states that are more central than westâ€”as the nation's best bet for big deer. While Illinois is generally viewed as tops for big deerâ€”and to its credit stays open until January 10â€”Wisconsin is actually producing the most Booner bucks right now. Ohio is not far behind. And you can hunt Ohio until February 5. So, if you completely and utterly dropped the ball for 2016, look to Ohio for 2017. If you don't have any hookups and don't want to pay an outfitter, try Dillon Wildlife Area, whose 4,000 acres sprawl across the counties of Licking and Muskingum. The West is odd because many western states target mule deer rather than whitetails, but this is a whitetail column. 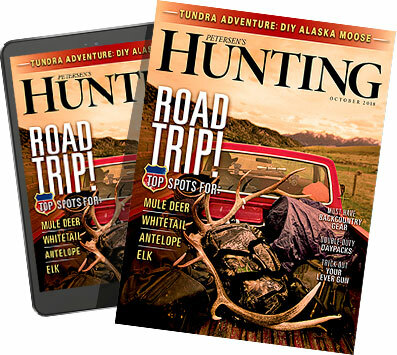 Fact is, there are some great opportunities for whitetails, even around Christmas, in states like South Dakota, but if you want to go really lateâ€”as in after-you-ring-in-the-new-year lateâ€” consider getting in your truck or hopping a plane to Texas. That's right, if all else fails and it's too late to hunt deer in the West, look to the Lone Star State. Thirty counties in the southern part of this vast body of land stay open until February 15. As a matter of fact, while you're there, you don't have to limit yourself to whitetails. You can shoot any number of deer-like exotic species, including axis deer. And if it gets too cold for you in Texas, I'll do you one better: Go to Hawaii and call Hawaiian Safaris. There is plenty of hunting, plus it's a great place to take your sweetie for Valentine's Day, so you can sit on a beach and plot the next deer season...this time hopefully in November.